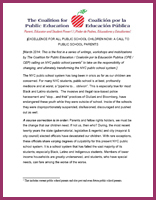 CPE 2014 POSITION PAPERS: "EXCELLENCE FOR ALL PUBLIC SCHOOL CHILDREN NOW". S.E.E.D.S. archival material (news-letters, reports, essays, forum information) is available below. As of April 2007, the new editions of “ROOTS”, the S.E.E.D.S. quarterly newsletter will also be archived here. Should you have any questions or comments regarding our newsletters, please contact us.